Turn iced coffee into a cocktail for summer entertaining. Here’s a recipe from Appleton Estate rum, produced in the lush countryside of Jamaica. 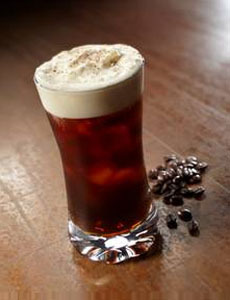 Jamaican Iced Coffee can be enjoyed with brunch, post-dinner or whenever you want your cocktail to provide a jolt of energy instead of putting you to sleep. Vanilla syrup is simple syrup flavored with vanilla. You can purchase regular or sugar-free vanilla syrup, or make your own with this recipe. 1. BUILD rum, Grand Marnier, vanilla syrup and coffee over ice into a highball glass. 2. GARNISH with fresh whipped cream and dust with ground cinnamon. Substitute coffee liqueur or chocolate liqueur for the orange liqueur. Garnish with nutmeg instead of cinnamon. FIND MORE OF OUR FAVORITE COCKTAIL RECIPES.